The Human Rights Campaign Foundation and PhotoSynthesis Productions are pleased to announce the film LIVING ADOPTION: GAY PARENTS SPEAK, a moving and insightful look at adoption by LGBTQ families. 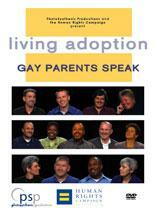 This DVD follows in the style of PhotoSynthesis' previous award-winning work, "Struggle for Identity" and "Foster Parents Speak," with a compelling cast of lesbian and gay adoptive parents who share their experiences, feelings, challenges and strategies. The DVD includes a 21-minute video, Bonus Scenes, a Discussion Guide and more. Building off the best practices in LGBTQ foster care and adoption developed by the HRC Foundation’s All Children – All Families initiative, the film and accompanying materials are excellent resources for use in adoption preparation classes for LGBTQ families, adoption support groups, academic classes and LGBTQ cultural competency training for social workers.